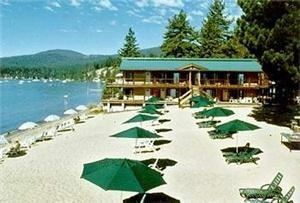 Stay on the Lake, enjoy your own private sandy beach and relax on the North Shore of Lake Tahoe with us at the Mourelatos Lakeshore Resort. Located 45 miles from the Reno Airport and 3 miles from the Nevada/California state line, the property is within walking distance of several restaurants and minutes from multiple outdoor recreation options, more restaurants and shopping. The property features 32 studio suites, each enjoying a spectacular view of Lake Tahoe and the surrounding Sierra Nevada Mountains. Each suite feature picture windows and includes covered patio seating overlooking the beach. Some suites feature fireplaces and jetted tubs and half the suites have full kitchens. Wireless high speed internet is also offered throughout the property. The property features their own ice cream shop on premises and offers multiple recreational amenities on property including buoys, beach sports equipment, a beach fire pit, two outdoor hot tubs, kayak rentals, BBQ sets and plenty of beach chairs, umbrellas and tables, all designed to make your stay comfortable, fun and memorable. We offer a small conference room that can accommodate a formal meeting of up to 20 people comfortably. We have a list of local companies we have worked with and recommend for providing everything from catering to entertainment. Contact us to find out more about groups we have hosted in the past and how we might help make your group function or family reunion in Tahoe the one they talk about with cherished memories. Situated in the heart of Gold Country, The Ridge Golf Course and Events Center offers you an event venue and the elegance that only Mother Nature could provide. An artful sweep of stone and glass, tucked away in a corner of the foothills, this stunning clubhouse sits atop a small ridge that overlooks a sea of towering pine trees, rolling-hills and sparkling ponds. A 100-year-old Blue Oak Tree stands to provide shelter from the brilliant setting sun and serves as the perfect location for you and your loved one to have their wedding and utter those cherished vows. Even more exceptional than our stunning location is our signature wedding and event service. At The Ridge, you will find a level of service seldom found anywhere else. At The Ridge - our professional staff prides itself on catering to your every need. You and your guests will enjoy personalized, professional attention as we host your event and hope to leave you with nothing less than memories to last a lifetime.